When it comes to engagement rings, their sartorial value is generally not up for discussion. (Unless, of course, you're Vogue.) Instead, in polite terms, we evaluate the engagement rings of others as typically being really big, more subtle, or truly unique. As far as fashion girls are concerned, most engagement rings fall into either the first or the last of those categories. We did a bit of hefty digging, and found 10 fashion insiders (editors, street style stars, stylists, and more) who have the rings that, for the most part, fall into both categories: They're sizeable enough for us to take notice, and they're unique enough to be worthy of a true It girl. Keep scrolling to see the 10 fashion insiders with the prettiest engagement rings—and to shop 12 rings inspired by them! 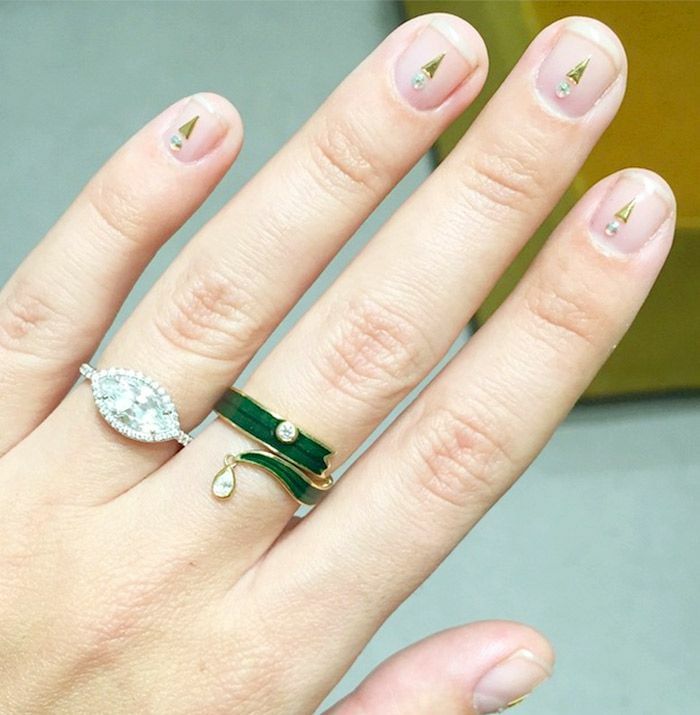 Keep scrolling to shop 12 cool-girl-approved engagement rings now! What's YOUR ideal engagement ring? Take our quiz to find out! Then share your results in the comments below.